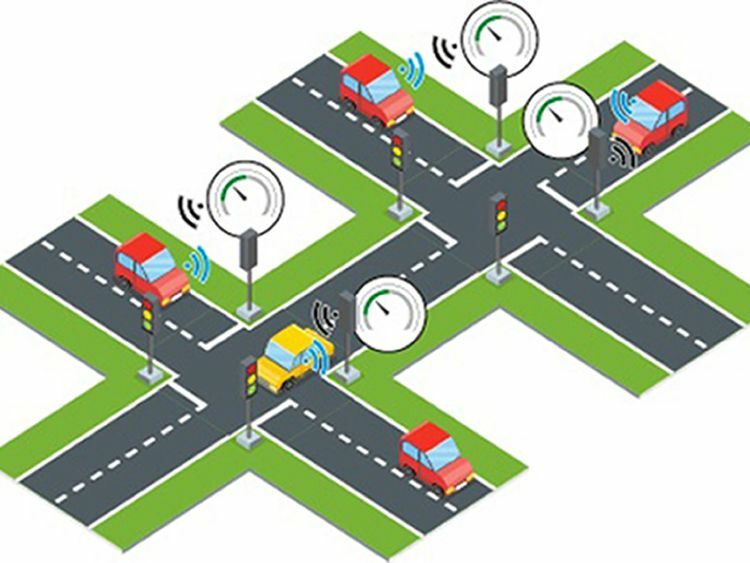 The hope is that it could cut congestion and reduce vehicle emissions through more efficient driving.The lights, developed by engineering firm AECOM, will be tested using a simulation model of the A59 in York.It is one of five concepts shortlisted in a competition launched by the National Infrastructure Commission (NIC), Highways England and Innovate UK to design roads for driverless cars. "We are excited and are eager to get started so we can better understand the potential impact of vehicle-to-infrastructure technologies on our local road network in York," said AECOM principal consultant Heather Hawkins. "We are fortunate to be living and working in a city which has chosen to be an early innovator, deploying and testing these technologies on-street through existing research programmes. It's truly inspiring and we are grateful to be a part of it." NIC chairman Sir John Armitt hailed the "progress" in the development of the cars of the future. "We can see for ourselves the progress in developing cars for the future, with trials of driverless cars taking place across the country," he said. "We now need to make sure the technology on our roads keeps up." RAC spokesman Rod Dennis praised the move to trial the traffic lights. "It is great to see novel technology like this being trialled," he said. "Stop-start traffic causes drivers to use their brakes more, which causes wear, and accelerate more, which can increase vehicle emissions."